NYC, 02/14/2019, 2:00PM. 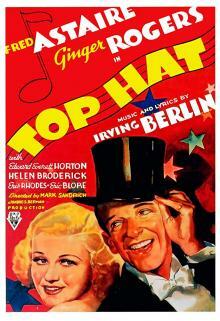 Top Hat (1935): Four time Oscar nominated musical comedy . 101 min. Director: Mark Sandrich. Starring Fred Astaire, Ginger Rogers, Edward Everett Horton. The film was nominated for the Academy Award for Best Picture, as well as Art Direction, Original Song, and Dance Direction. In 1990, Top Hat was selected for preservation in the United States National Film Registry by the Library of Congress as being "culturally, historically, or aesthetically significant". The film ranked number 15 on the 2006 American Film Institute's list of best musicals.